Northwestern University faculty, postdoctoral fellows and students who contributed to the historic Sept. 14 detection of gravitational waves by the Laser Interferometer Gravitational-Wave Observatory (LIGO) are being honored for their research. The LIGO Scientific Collaboration (LSC), a group of more than 1,000 scientists and engineers from universities around the U.S. and in 14 other countries that conducts LIGO research, recently received two significant honors: the $3 million Special Breakthrough Prize, recognizing extraordinary scientific achievement, and the 2016 Gruber Foundation Cosmology Prize, recognizing a discovery leading to fundamental advances in understanding the universe. Vicky Kalogera, the Erastus O. Haven Professor of Physics and Astronomy in the Weinberg College of Arts and Sciences and director of Northwestern’s Center for Interdisciplinary Exploration and Research in Astrophysics (CIERA). An LSC member for more than 15 years, Kalogera is one of LIGO’s most senior astrophysicists and led the LSC’s astrophysics effort as the LIGO editor of the paper about the discovery’s astrophysical implications. 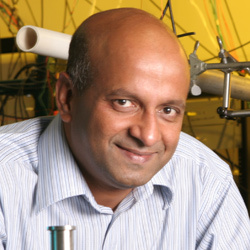 Selim Shahriar, professor of electrical engineering and computer science in the McCormick School of Engineering. Shahriar works on the laser physics of the LIGO enterprise. He is looking for ways to improve the sensitivity of the LIGO detectors and broaden the spectrum that the detectors are sensitive to. For the Special Breakthrough Prize, $1 million will be shared between the three LIGO founders, Ronald Drever, Kip Thorne and Rainer Weiss, and the remaining $2 million will be shared equally by the 1,012 contributors. The scientists and engineers will be recognized at the 2017 Breakthrough Prize ceremony in the fall of 2016, where the annual Breakthrough Prizes in fundamental physics (distinct from the special prize), life sciences and mathematics also will be presented. The 2016 Gruber Foundation Cosmology Prize, awarded by the Gruber Foundation, honors a leading cosmologist, astronomer, astrophysicist or scientific philosopher for theoretical, analytical, conceptual or observational discoveries leading to fundamental advances in understanding the universe. The award ceremony will take place July 12 at the 21st International Conference on General Relativity and Gravitation, to be held at Columbia University in New York. LIGO was built between 1994 and 2002 by Caltech and Massachusetts Institute of Technology in partnership with the National Science Foundation with the aim of observing the gravitational waves predicted by Einstein’s general theory of relativity. After a major upgrade from 2010 to 2015, it almost immediately observed gravitational waves distorting the structure of spacetime as they passed through the Earth. The discovery inaugurates a new era of gravitational-wave astronomy that will open a window onto some of the most dramatic and violent phenomena in nature as well as the mysteries of the early universe.